Take Down Garden Spray is a combination of natural pyrethrin and canola oil, which as a combination provides a quick knockdown with residual control. It can be used indoors, outdoors, in greenhouses, on fruit and nut trees, vegetables, grapes, strawberries, citrus, houseplants and all ornamental plants. Take Down Garden Spray is an insecticide and miticide that kills all accessible stages of listed insects, including eggs. It is a dormant and growing season spray and can be used up to the day of harvest. Take Down Garden Spray is a combination of natural pyrethrin and canola oil, which combines the best of two worlds — quick knockdown (pyrethrin) and residual control (canola oil). Take Down Garden Spray will kill the following insect pests: aphids, beetles (Colorado potato beetle, flea beetle, Japanese beetle, asparagus beetle), caterpillars (gypsy moth caterpillars, tent caterpillar, diamondback moth larvae, leafrollers), ants (except Fire Ants, Harvester Ants, Carpenter Ants and Pharaoh Ants), mealybugs, mites, leafhoppers, scale insects, whitefly, adelgids, plant bugs, fungus gnats, thrips, sawfly larvae, psyllids, spittlebugs, and phylloxera. Apply at a rate of 1 or 2% solution. 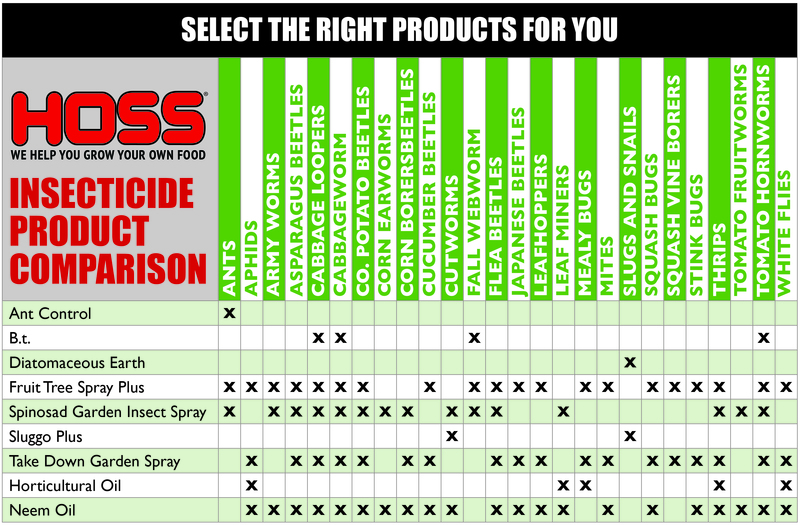 For soft-bodied pests such as aphids and mites, a 1% solution is sufficient. For use outdoors on fruit and nut trees (apples, cherries, peaches, pears, nuts); flowering, foliage plants; corn; melons; tomatoes; vegetables (beans, cabbage, cucurbits, peas, potatoes); figs; small fruits (grapes, strawberry, raspberry); citrus; ornamental and shade trees (birch, evergreens, holly, oak). Do not apply more than 4 fl. oz. of concentrate (400 fl. oz. of 1% solution or 200 fl. oz. of 2% solution) per 1,000 square feet. For a 1% formulation, mix 2 teaspoons in 1 quart of water or 1 oz. in 3 quarts of water. For a 2% formulation, mix 4 teaspoons with 1 quart of water or 2 oz. with 3 quarts of water. Shake well. Do not apply when temperatures are above 90 degrees Fahrenheit. Wait until early morning or late evening to apply in hot climates.